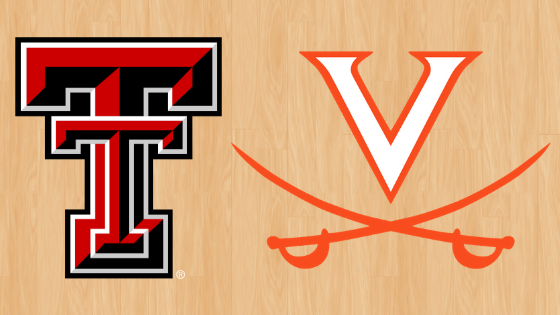 The two best defensive teams will meet in the 2019 NCAA National Championship game – but don’t sleep on Texas Tech or Virginia’s offense. This year’s championship game brings together two opponents with similar offensive philosophies. Both Texas Tech and Virginia will play a majority of the game within their motion offenses, patiently waiting for the defense to break down so they can get an open shot. 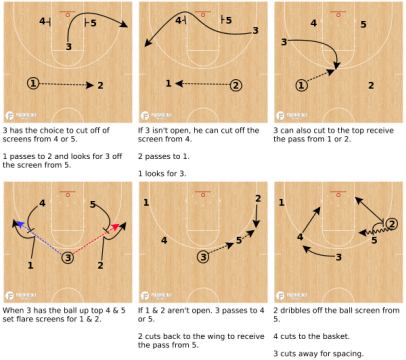 The Red Raiders will screen and cut with all five players on the court, whereas the Cavaliers players have distinct roles with three screeners and two cutters. Playing a motion offense makes it difficult for a defense to scout but it also makes it hard for the offense to make sure they get the ball to who they want in specific situations. A great time to look for Texas Tech and Virginia to switch up their offense to get a specific look is after a timeout (view all ATO’s on the PlayBank!). Look out for these plays in the championship game tonight. Click on a diagram to download it to your FastDraw library. Also make sure to tune into our Twitter account tonight for live plays and content during the game! Can’t start this post about the title game without showing you the diagram of the biggest play that helped the Cavaliers reach this point. Coach Tony Bennett dialed up this set for his sharp-shooter Kyle Guy with 1.8 seconds left vs Auburn, which led to a foul in which Guy hit all three free throws to win the game for Virginia. This has been one of Virginia’s favorite after-timeout plays of the NCAA tournament so far. 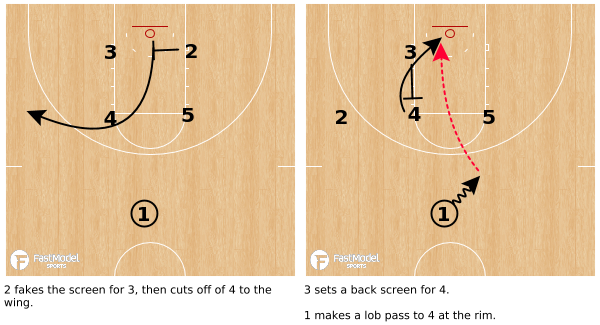 The baseline screen for 3 is a similar action to what they get in their Blocker-Mover motion offense. This time they run it as a set play to make sure Kyle Guy (3) gets the ball for a look at a three-point shot. 1 dribbles left off the screen to shift the defense to that side of the floor. On the airtime of the pass to 5, 1 cuts across the lane and 3 cuts off the screen from 4. 5 passes to 3 for the shot. 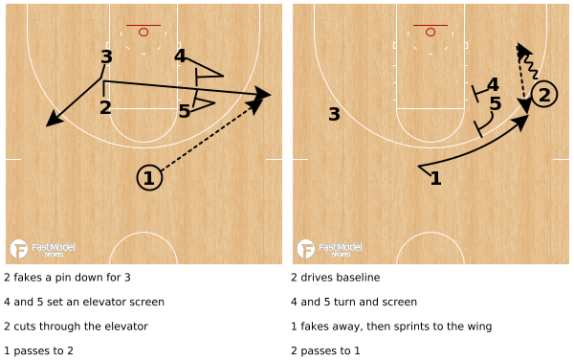 The Cavaliers run this quick hitter to take advantage of the strength and finishing ability of De’Andre Hunter (4). As the point guard dribbles to the wing 4 screens for 5 in the middle of the lane. 5 curls around the screen as 4 seals his defender behind him. 1 passes to 4 in the post for the layup. The Red Raiders tried to open their Final Four game against Michigan State with a bang, with this variation of their box set for a lob dunk. 2 fakes the cross screen for 3 then cuts over 4 to the wing. This is a common action that they run in their “Box PNR” play. 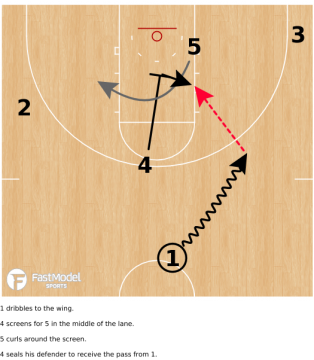 As 2 cuts to the wing 3 sets a back screen for 4. 1 then passes to 4 at the rim for the lob dunk. There are moments in their games when Texas Tech wants to get their ball to their star player Jarrett Culver (3). In this play they will run him off of baseline screens to get him open for a shot on either side of the floor. If 3 can’t get open on the baseline he will cut up top for the pass. 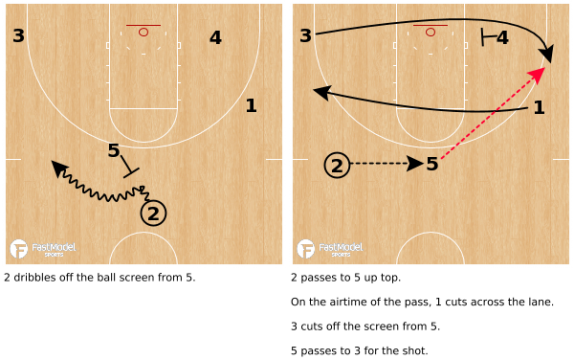 The Red Raiders will then go back to their motion principles with 4 and 5 will setting flare screens for the guards. 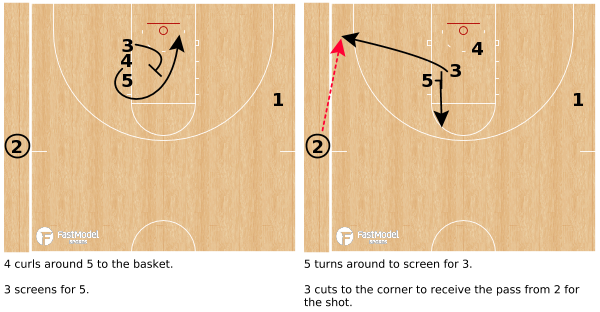 3 can read the play and make the pass to any of the cutters or screeners. If the ball goes to 4 or 5 they will then go into a side pick and roll with a guard. Enjoy the National Championship game and follow along on Twitter for live XsOs and commentary!